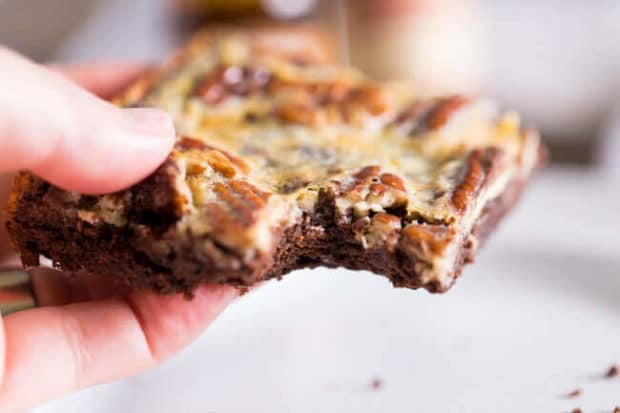 Add Old-fashioned Chocolate Pecan Pie Squares to your holiday menu. In my world, holidays begin as soon as I rip October off the calendar. I’m thinking about my gift-giving strategy before that, but the fun stuff can’t happen until the calendar turns. 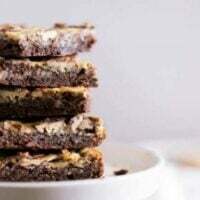 I’ve been collecting new recipes—like these divine Old-fashioned Chocolate Pecan Pie Squares—to try during the season. I’m so glad I discovered Nielsen-Massey; they are going to be part of my holidays from now until forever. Try their rich vanillas in your recipes and you’ll know why. Thanks for sponsoring this post, Nielsen-Massey Vanillas! I love the sparkle and shine of the holiday season—family and friend get-togethers, surprise secrets, and all that food. Whether a holiday gathering is a low-key celebration or an over-the-top extravagance, I always want the food I serve to be something special, memorable. I’m sure I’m not the only one who has salivated over a beautiful-looking confection only to discover, in one bite, it was nothing more than eye candy. Bah. I want my holiday treats to be worthy of the occasion. With their rich, complex flavors, Nielsen-Massey Vanillas help make it so. 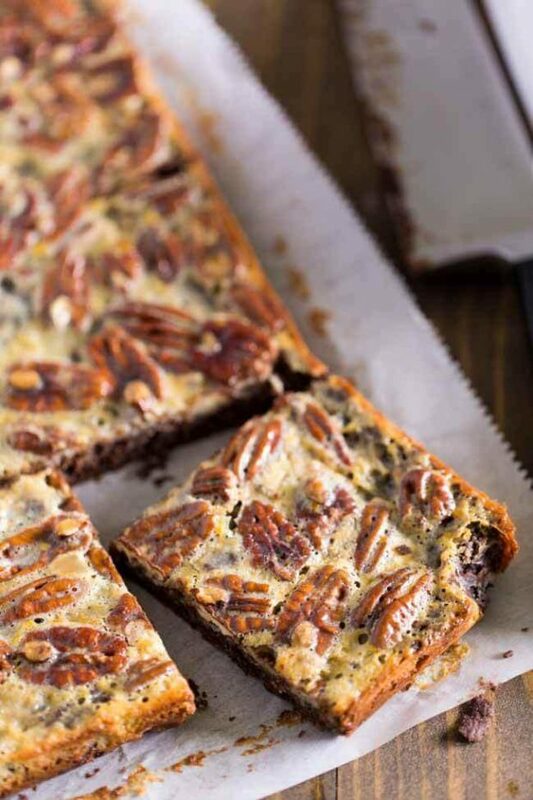 I also used their Pure Chocolate Extract in this pecan pie squares recipe. It is crafted from the finest cocoa beans. Oh my. Yes. There’s a whole line of pure flavors that gets my creative juices going. 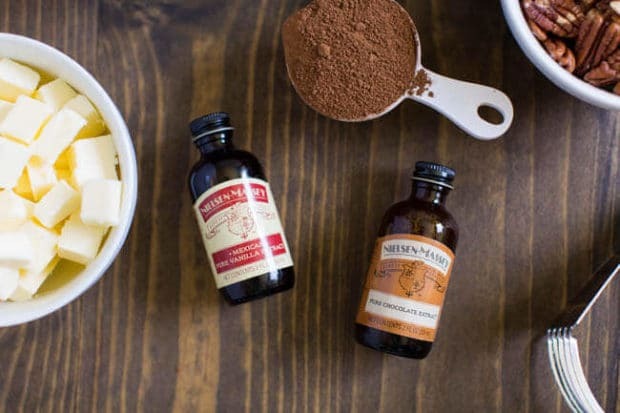 Besides the Pure Chocolate Extract, Nielsen-Massey offers other extracts too: Pure Almond, Pure Coffee, Pure Lemon, Pure Orange, Pure Peppermint. And then there’s Rose Water and Orange Blossom Water. Imagine the exotic flavor possibilities! I like the idea of being able to add a flavor boost without having to chop, zest, or juice. That’s the kind of convenience that really matters when you’re into holiday baking marathons. The Nielsen-Massey Vanillas began in 1907 when their family founded the company. Three generations later, they still own and operate the business. Their products are all-natural, certified gluten-free, Kosher, allergen-free and GMO-Free. They even examine all the vanilla beans they use by hand, bundle-by-bundle. when its natural essence is allowed to shine so they use a cold extraction process (which takes 3-5 weeks) instead of heat extraction (which takes 3-5 days and cancels a lot of flavor). Cold extraction preserves the 300+ distinct and delicate flavors in vanilla, which of course yields a more complex flavor. That translates into richer tasting recipes… and more compliments for the cook! 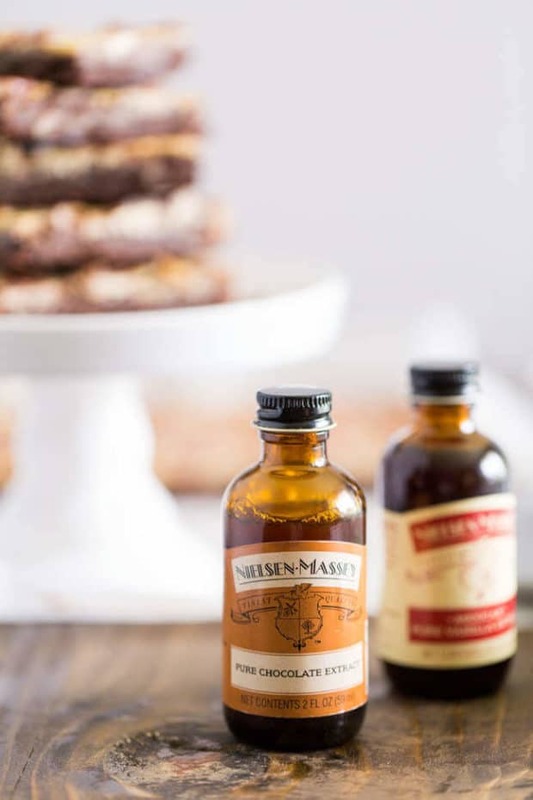 Check out Nielsen-Massey Vanillas for recipe inspiration and to learn more. 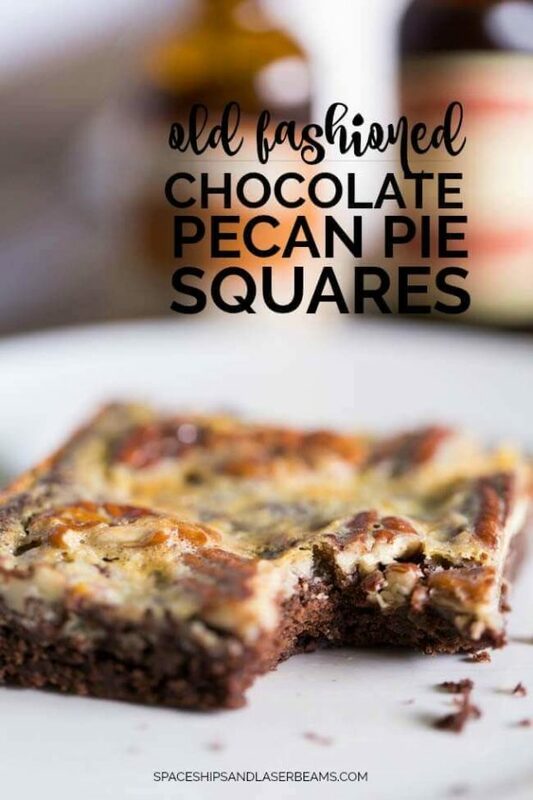 And check out my recipe for Old-fashioned Chocolate Pecan Pie Squares. They are sublime! 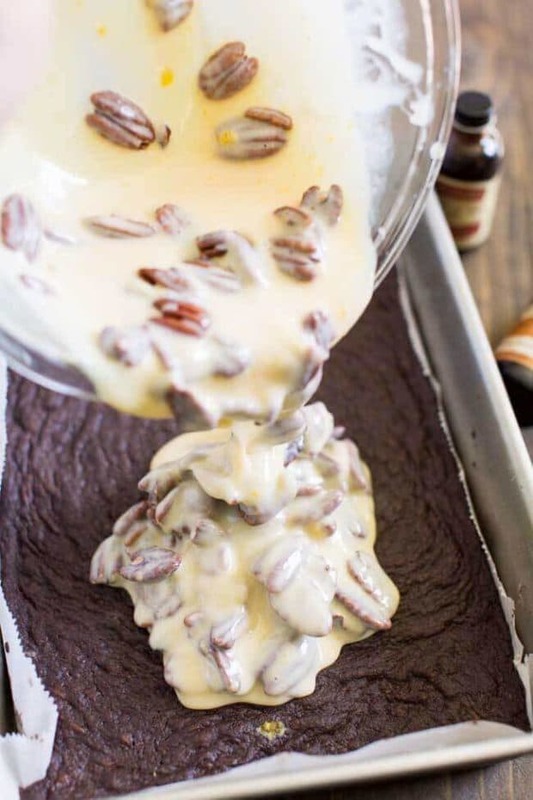 Quality ingredients like the extracts, real butter, and fresh pecans make a noticeable difference in the final taste. First, combine flour, sugar, and cocoa in a medium-sized bowl. Using cold butter in this recipe really is the best idea. I’ve microwaved a frozen stick of butter before but the melted butter takes the bottom layer beyond chewy—it becomes a little too “tough”. 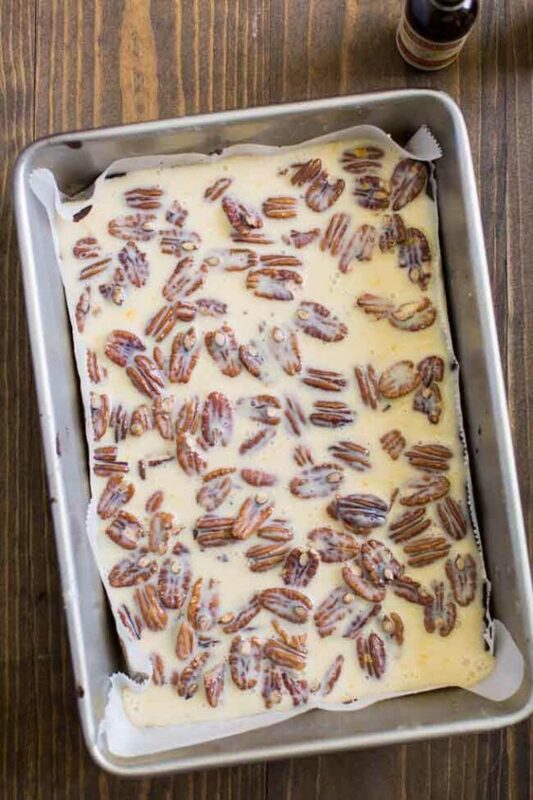 While the bottom fudge-y layer is baking, combine sweetened condensed milk and egg and stir in the pure extracts and pecans. Pour this liquid mixture over the initially baked bottom layer and pop it back in the oven for another 20-25 minutes. You’ll know it’s finished when the top is golden brown. You can eat these warm, right from the oven, yet they’re also excellent cold. You’ll probably eat the first bar with gusto—it’s hard not to!—but take your time the second time around. 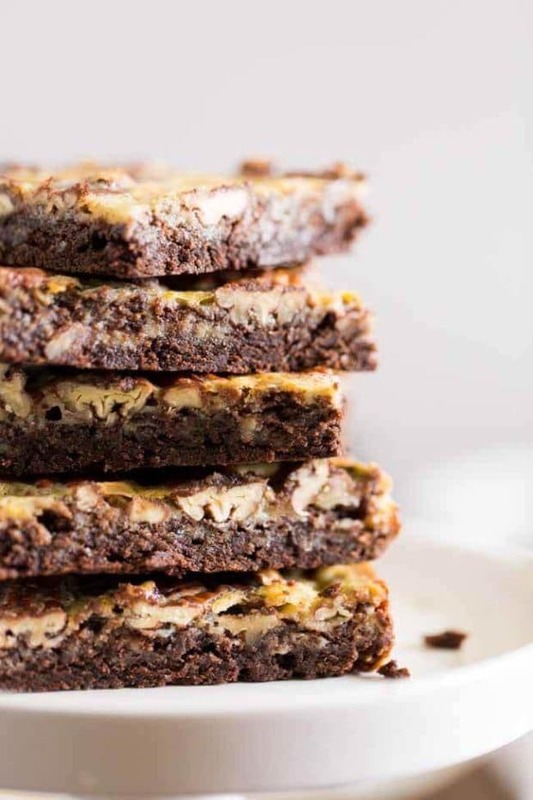 Chocolate Pecan Pie Squares are versatile. They’re the kind of treats that dress up a holiday dessert bar yet they’re perfect for packaging and holiday gifting. The outer layer has this wonderful crisp edge while the core is a rich, chewy, chocolate delight. It’s kind of like a present inside a present. 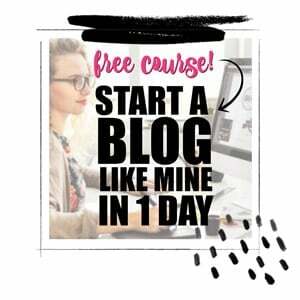 Fun stuff…for when the calendar turns! 2. 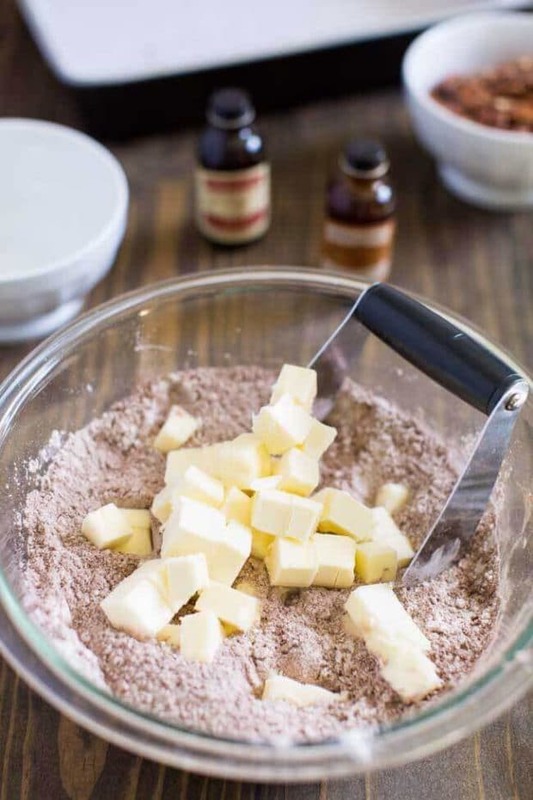 In a medium size bowl, combine flour, sugar, and cocoa powder. 3. Using a pastry cutter, cut in cubes of butter until the mixture comes together. 4. Line a 9x13 baking pan with parchment paper or foil and press the dough into the bottom of the pan. The dough will be a little sticky, so be sure and flour your hands to keep the dough from sticking to your fingers. 6. Combine the sweetened condensed milk and egg and whisk together until smooth. 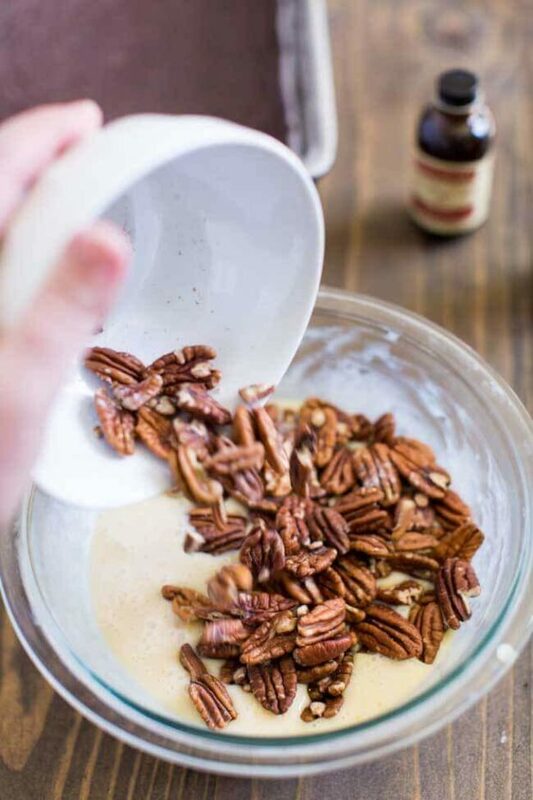 Stir in extracts and pecans. 7. When the pan comes out of the oven, pour the mixture over the top and return to the oven for 20-25 minutes until the top is golden brown. Can I just say, these are so good. They didn’t last long in my house.